apms.ap.gov.in - AP Model School Intermediate admission 2017-18 - online application | Procedure for fill APMS Inter online Application form | How to apply APMS intermediate admission 2017 | APMS inter admission last date | download APMS inter application form | download apms hall tickets online.| apms notification 2017. The Commissioner of School Education & Director, of A.P. 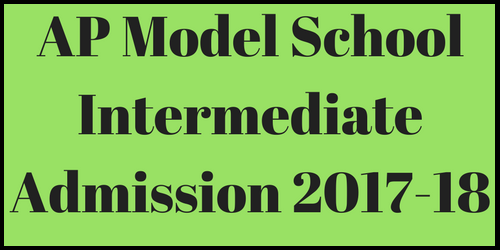 Model Schools has released notification Admissions into 1st year Intermediate courses M.P.C, Bi.P.C,M.E.C, & C.E.C groups, having 20 seats in each groups for the academic year 2017- 2018 in 160 model schools. Students who have completed their S.S.C. Examinations successfully. 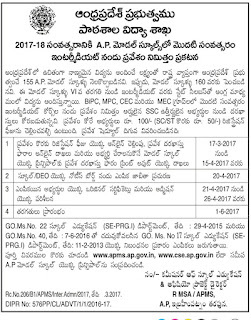 those candidate are eligible for get admission into AP Model school. Interested and eligible candidate can submit their application through online, on or before 15-Apr-2017. 1. Online Payments of registration fee for admission, online submission of admission application forms and submission of printout of admission application to the principal of the Model school in which the candidates wish to join - 15-Mar -2017 to 15-Apr-2017. 2. Downloading the list of candidates registered for admission by the principal - 17-Apr-2017. 3. Preparation of school wise merit list by the concerned schools - 18-Apr-2017. 6. Verification of the Original Certificates and admission of the selected candidates. - 21 -Apr -2017 to 26-Ape -2017. 7. Commencement of the classes - 1-June-2017. How to (apply ) Register APMS Intermediate Admissions 2017 ? 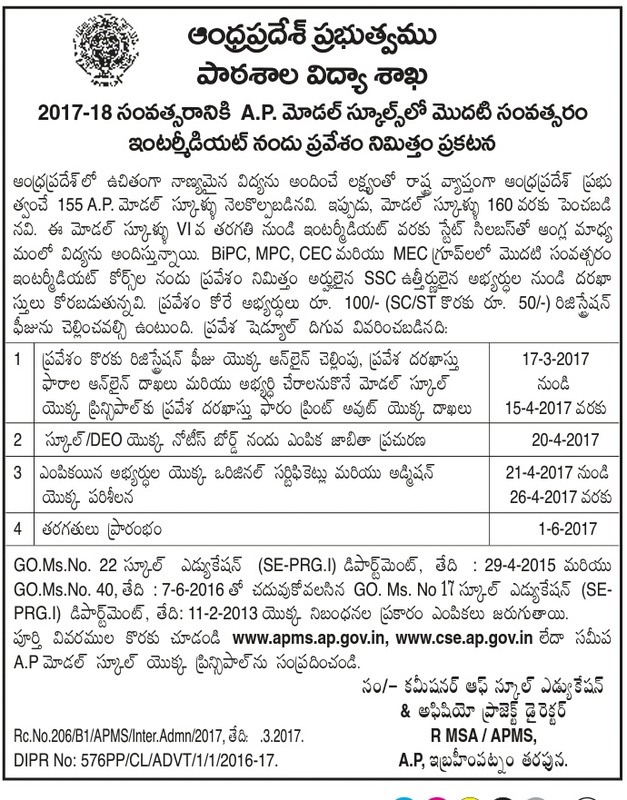 Interested & Eligible candidates can Visit AP Model School Official website http://apms.ap.gov.in/ , click on " AP MODAL SCHOOL INTERMEDIATE ADMISSION APPLICATION SUBMIT HERE" option, and first pay Examination fees, after fees payments completed successfully, than click on "Submit Application' Button , fill all necessary details on online application form, than submit your application online. 2. Than click on "Make Payment Button"
12. finally click on " Proceed" Button. After Successfully completed Payment method, Than click on "Submit" Application Button. 6. Now click on "Choose file " button. 9. Than Click on "Upload" button. Finally fill the all necessary details in the application, before final submission Check the filled online application carefully, if have any mistakes in the application form, than conform your online application.